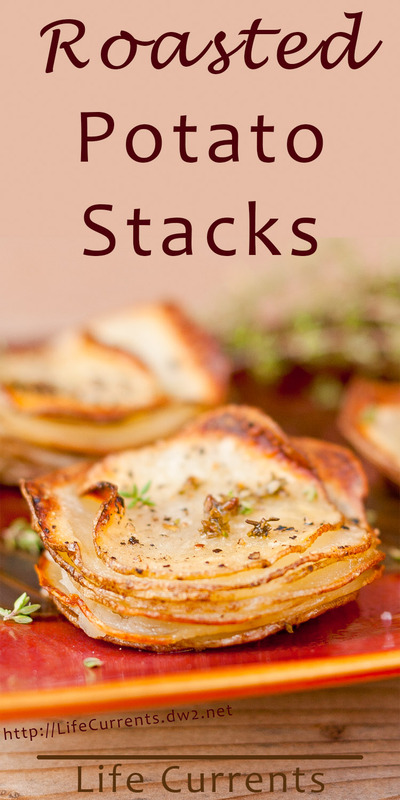 These Roasted Potato Stacks are impressive looking and tasty. They get crispy little edges and a soft, almost creamy center. They’re perfect for any special family dinner, holiday gathering, or brunch! I made these Roasted Potato Stacks for Christmas Breakfast. Get the whole Christmas Breakfast menu here. I changed a few things from the original recipe. Most notably, I don’t think the potatoes need to be peeled. I made some without peels and some with peels, and honestly I couldn’t see a difference. There are two reasons I like to leave the peels on potatoes: one is nutrition (the skins have so many vitamins and minerals), the other is that I’m lazy about peeling potatoes, and if I don’t have to do it, I’m not gonna take the time. These stacked potatoes are a lot like a roasted potato that I’ve made many times. I take thicker slices of potato and lay them out on a silpat lined baking sheet. Then, I take a wadded up paper towel and dab it in olive oil. Sprinkle with salt and bake in a 350 oven until golden and crispy. Perhaps not as pretty in the presentation, but you get the same effect. You can use the wadded up paper towel instead of the pastry bush in these roasted potato stacks as well. I found this recipe originally through Pinterest from a site called Gourmand Recipes. That site has since gone down, and is no longer available, so I’m glad I made these and posted about them when I did. Preheat oven to 350 degrees F. Using a pastry brush, lightly brush 8 muffin tin cups with oil. Using a Mandoline, thinly slice the potatoes. Starting with the smaller pieces, layer a potato slice in the bottom of each of the 8 muffin cups, and brush each potato slice with a thin layer of oil. Lay another slice of potato into each tin, and brush with oil. At every third layer, sprinkle with a little salt and pepper. Repeat stacking, brushing with oil, and seasoning until you have used up the potato slices. At the top of each stack, season with salt and pepper, and sprinkle with fresh thyme leaves. Bake for 35-45 minutes or until the potatoes are golden brown and cooked through. Garnish with additional fresh thyme leaves as desired. Oh jeesh, these are just too cute! =) I’m so stealing this idea for dinner tomorrow night. I just saw these on eRecipeCards.com and had to stop on over. They look so elegant yet simple to make. Nice post. These sound delicious! And what pretty presentation! I’m with you that I’m not going to peel potatoes unless absolutely essential. Most of the time I think the peel makes the dish better, not worse. Thanks for sharing on my FB page. They are exactly what i wanted! Hello, I make up this recipe, its delicious, I send you a link form my blog if you want to see the recipe. Thank you for share the recipe. G’day! These look terrific Debi and is now on my list to do! Great photos! These would be perfect with a nice roast chicken dinner! I love that they are simple, but so pretty. We’re big potato fans here, so I know these would be a huge hit! Sending some foodie love your way!